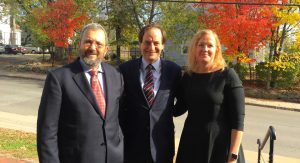 On October 23, the Center for Strategic Studies hosted two high-level visitors from Israel, former Prime Minister and Defense Minister Ehud Barak and former Deputy Prime Minister and Minister for Intelligence and Strategic Affairs Dan Meridor, for a conversation with the Center’s team of faculty, postdoctoral fellows, and PhD fellows. The discussion touched on the longevity of the threat of global terrorism and how today’s nuclear proliferation challenges (e.g. Iran, North Korea) demonstrate the failure of the international nonproliferation regime. From the Israeli perspective, whereas Israel’s security was threatened by neighboring countries for its first 50-60 years, that era is over, and the major challenges today—such as polarization—come from within Israeli society. The guests discussed the many different effects of globalization, including how it has empowered the individual and made “subconventional” war more rampant. Globalization has also elevated 1.3 billion people out of poverty but its benefits in the “West” have not been equitably distributed. This has in turn produced the recent rise of right-wing populism, which, optimistically, might not be sustainable. However, in order for the pendulum to swing back, the left will have to come to appreciate the values of community that have protected humanity for millions of years and that most people continue to hold dear.